it may come as a shock to some but the CPS, the Police force and the Judiciary are complicit in all these decision and I can just imagine the conversations that have taken place to come to this decision. I am not sure what happens next but so far it is almost as if the inquiry never took place. The prosecution have put it to Duckenfield that he was directly responsible for the deaths of the 96 by failing to carry out his role as match commander to a satisfactory standard thereby compromising the safety of the spectators. jurors at the trial of Hillsborough match commander David Duckenfield have heard how ''the scene was almost literally set for failure''. Prosecutors stated that the ground's safety certificate had not been updated or amended since it was granted in 1979 - a decade before the disaster. 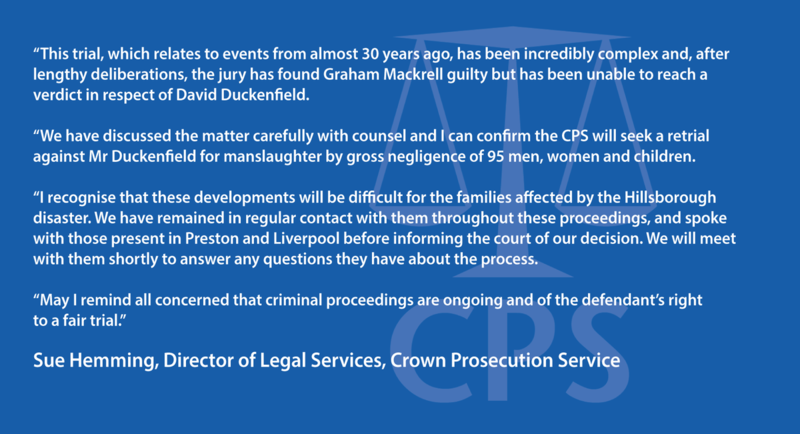 Duckenfield denies the charge of gross negligence and the manslaughter of 95 Liverpool supporters. Ex-Sheffield Wednesday secretary Graham Mackrell denies safety breaches. The jury has retired to consider the verdicts on Duckenfield and Mackrell. There can only be one verdict stuey. The evidence presented is damning Billy and let's hope the truth about Hillsborough and those involved in the cover up will be revealed. I just hope it doesn't stop with the verdict on Duckenfield and Mackrell but gives some clue as to why it has taken over 30 years to get to this point with the establishment obstruction at every opportunity. I just will not believe it until I see him behind Bars he is part of the Establishment and they don't like the working man getting one over on them. Even when he is found guilty the sentencing will be intereting. Let’s not forget the establishment were forced into giving up two of its number to face legal proceedings, they know the outcome will open the prospect of a much deeper examination of the 30+ years of cover-up. For that reason a guilty verdict is probably as important as the sentencing handed out. Retrial for Duckinfield. No verdict no surprise more angst and heartbreak for the Families who just want Justice. The Sheffield Weds.Sec guilty of failing to discharge his duty under Health and Safety ACT. Surprised ? Not really what is it that the Jury don't get it is for me as clear as daylight he failed to do his duty and people died. Its hard to believe but there are still lots of people think the Fans themselves are responsible and I fear this is reflected in this Jury's decision or lack of it. How the Judge ruled that Duckenfield shouldn't be called to the witness box is beyond me. How could the jury find him guilty when he was never cross examined. For any retrial would need Duckenfield to be cross examined. Just going over the same evidence won't mean much.Don't know what the criteria is for a retrial but justice denied so far. Can one of my over the pond friends answer this question I have. I've seen a lot of people talking about what you can and can't discuss with regards to this trial (or most trials that happen in England). On Reddit, they even lock threads so that people can't comment, I guess this has something to do with the defendants right to a fair trial. I get that, in America the defendant has a right to a fair trial as well, but things but it's not like people can't comment in the media or on social media about the proceedings, whereas it appears in England you aren't allowed to do that? Just trying to understand how people think that anything said in the media or on social media could possibly influence jurors anymore than they are already influenced by their own bias and opinions? If any uncorroberated claims in relation to a legal procedure are made in any format in the public domain any libellous issues can be pursued in a court of law. What if they are made by someone that isn’t a UK citizen? If they are in the UK at that time the same applies, obviously it could affect any ongoing legal procedure. Not entirely certain about matters originating outside of the UK regarding libellous statements. I know how pissed off we all are on here about the outcome of this trial.....so far. Imagine if you can having lost one or more loved one's and 30 years later 12 people still cant get it through their thick skulls the supporters were innocent, there is still an undertone of "blaming those scousers" How on earth these poor people go through this day after day year after year and continually get knocked back but somehow they get back up and keep moving forward and will continue to do so. I am absolutely in awe of these people they are just incredible. If it was one of me I’d be doing the same. I don’t post often. Like to keep my thoughts to myself on this matter. But when I heard the result of the trial a couple of weeks ago,I wasn’t surprised. I was just sad. One things for sure though, they’ll keep fighting.